Some say the Wild Elves used these caves as a mausoleum. Certainly something about this place brings to mind things that should be dead, but refuse to stay that way…. 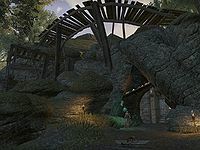 Pothole Caverns is a cave in southern Cyrodiil, between Castles Black Boot and Faregyl containing Shadowed Path necromancers. 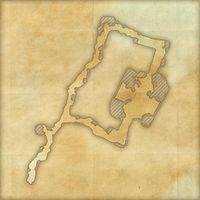 Explore and clear Pothole Caverns. Pothole Caverns also appeared in Oblivion. The presence of three bosses makes this cave particularly difficult to clear, as only a single boss can be alive at any given time in this delve.